NEW SIZE! Created by Eli's granddaughter, Elana, Cuties are bite-sized pieces of Eli's Cheesecake, enrobed in chocolate and brushed with festive edible gold dust. They're the ultimate "box of chocolates" and a perfect hostess gift! 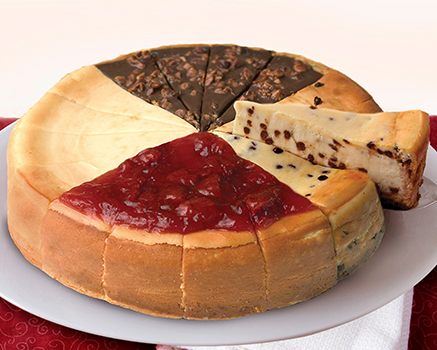 Thaw Eli's Cheesecakes in the refrigerator for up to 2 hours. Serve frozen or chilled. Ingredients: Cream Cheese (Pasteurized Milk and Cream, Cheese Culture, Salt, Carob Bean Gum, Guar Gum), Dark Chocolate Coating [Sugar, Chocolate Liquor Processed with Alkali, Coconut Oil, Cocoa Butter, Milkfat, Soy Lecithin (Emulsifier) and Vanillin], Sugar, Graham Crumb (Unbleached Unenriched Wheat Flour, Whole Wheat and Graham Flour, Sugar, Palm and Palm Kernel Oil, Molasses, Honey, Salt, Sodium Bicarbonate), Sour Cream (Cultured Nonfat Milk and Cream, Corn Starch, Whey, Guar Gum, Carrageenan, Carob Bean Gum, Enzymes), Egg, Butter (Cream, Salt), Wheat Flour, Egg Whites, Vanilla Extract, Salt, Edible Gold Powder. I am a cheesecake fanatic, and to say these were the perfect combination of sweet decadence and pure silk would be an understatement. They're the perfect size for any occasion. Amazing.